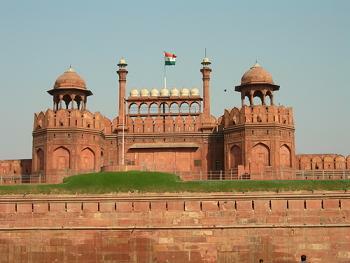 Red Fort or Lal Qila is the Delhi's most magnificent and oldest monument. The Red Fort was built by Emperor Shah Jahan in 1648. The emperor Shah Jahan built this fort on the banks of Jamuna in Shahjahanabad, the city founded by him which is now known as Old Delhi. 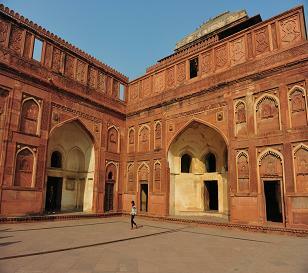 This fort is one of the most spectacular pieces of Mughal architecture. The Red Fort is one of the most magnificent palaces in the world. Shah Jahan was one of the greatest rulers of the Mughal Dynasty in India. In 1638 when the emperor moved the capital of India from Agra to Delhi, a new royal palace was constructed which was known as the Red Fort or Lal Qila. The Mughal emperor Shah Jahan started construction of the massive fort in 1638 and work was completed in 1648. The Red Fort served as the center of the Mughal Empire for more than 200 years. The Red fort is very powerful fort with immense fortifications. The Lal Qila rises above a 9 m wide dry deep moat, originally fed by the Yamuna River. The river itself has now shifted more than 1 km to the East. This fort is known so due to its massive red sandstone walls which have withstood the vagaries of time and nature. Its walls extend from two kilometers and vary in height from 18 metres on the river side to 33 metres on the city side. This fort is built in an octagon shape measuring 900 m by 550 m. The fort contains some of the buildings of the Mughal government which are Diwan-i-am (Hall of public audience), Diwan-i-Khas (Hall of private audiences), domed and arched marble palaces, plush private apartments, a mosque and elaborately designed gardens. Even today, the fort remains an impressive testimony to Mughal grandeur, despite being attacked by the Persian Emperor Nadir Shah in 1739 and by the British soldiers during the war of independence in 1857. 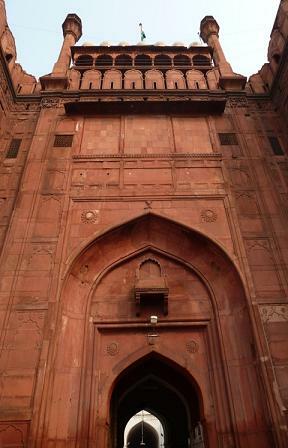 The main entrance to the fort is through the imposing Lahore Gate. This gate is named so as it faces Lahore, now in Pakistan. Some important speeches have been made here by freedom fighters and national leaders of India. The Lahore Gate overlooks the large Maidan, the massive open space. This maidan has been used for political rallies ever since the time of the independence movement. It is from here that the Prime Minister of India address the people on 15th August, the Independence Day. The main entrance opens on to the Chatta Chowk. This place was also known as the Meena Bazaar, the shopping centre for the ladies of the court. This market houses the Delhi's most talented jewellers, carpet makers, weavers and goldsmiths. This bazaar has an excellent collection of antiques, miniature paintings, ivory jewellery and carpets. Just beyond the Chatta Chowk is the heart of the fort called Naubat Khana or the Drum House. The musicians used to play for the emperor from the Naubat Khana and the arrival of princes and royalty was heralded from here. The Fort also houses the Diwan-i-Am or the Hall of Public Audiences where the Emperor would sit and hear complaints of the common people. His alcove in the wall was marble-paneled and was set with precious stones, many of which were looted after the mutiny of 1857. The Diwan-i-Khas is the hall of private audience where the Emperor held private meetings. This hall is made of marble and its centre-piece used to be the Shah Jahan's Peacock Throne, which was carried away to Iran by Nadir Shah in 1739. The palace is made of white marble and decorated in gold and precious stones. On the ceiling above it are written the famous verses of Amir Khusro in gold letters "If there is a paradise on earth, it is this, it is this, it is this." Today, the Diwan-i-Khas is only a pale shadow of its original glory, yet the verses of Amir Khusro reminds us of its former glory. The other attractions within this monument are the Royal Baths or hammams, the Shahi Burj, which used to be Shah Jahan's private working area and the Moti Masjid or the Pearl Mosque, built by Aurangzeb for his personal use. The Rang Mahal or the "Palace of Colours" housed the Emperor's wives and mistresses. This palace holds a spectacular Lotus shaped fountain, made out of a single piece of marble. This palace was crowned with gilded turrets and delicately painted and decorated with excellent paintings, gold bordered projections, with an intricate mosaic of mirrors, and the ceiling was overlaid with gold and silver that was reflected in a central pool in the marble floor.